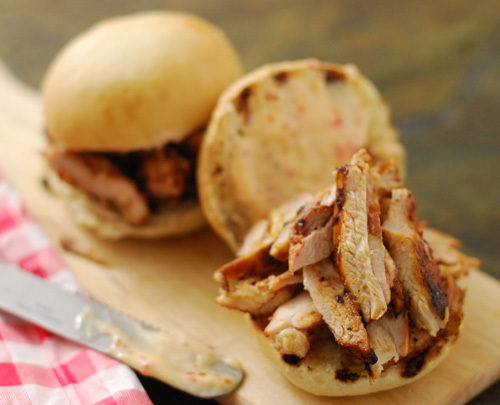 Here’s a easy slider recipe that is perfect for late summer nights and is sure to please a crowd. It’s flavorful grilled chicken with a creamy red pepper sauce that is nothing short of luxurious. But first, my farewell. This is the Final Fire Day Friday post here on Our Krazy Kitchen. I will keep posting on my blog, Nibble Me This. 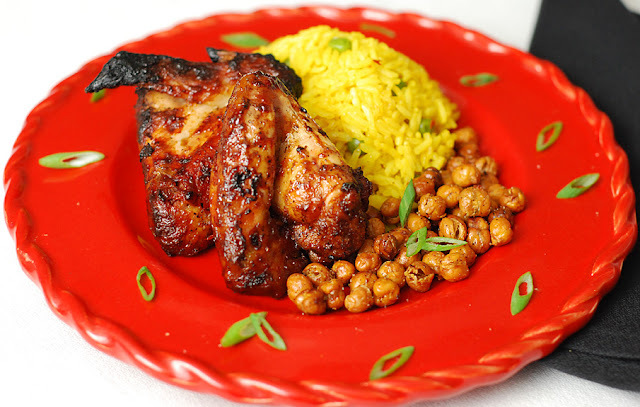 Place the marinade ingredients in a blender or food processor and blend/process until liquified. 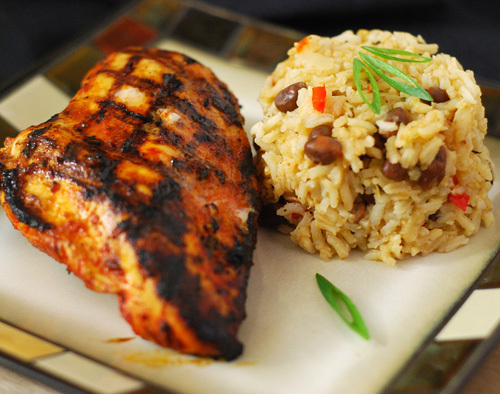 Marinade the chicken for 12 hours. 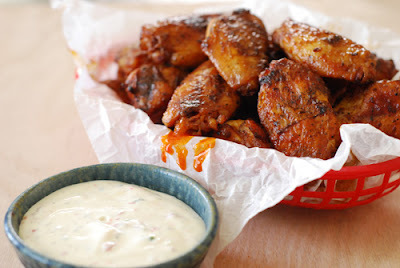 Thoroughly mix the creamy red pepper sauce together and refrigerate. Cook dinner rolls according to direction and then split in half for buns. Preheat a charcoal grill to 350f. Remove chicken from marinade and grill until the reach an internal temperature of 165f (about 6 minutes per side). Allow to cool for 10 minutes. Thinly slice. Toast the split buns on the grill. 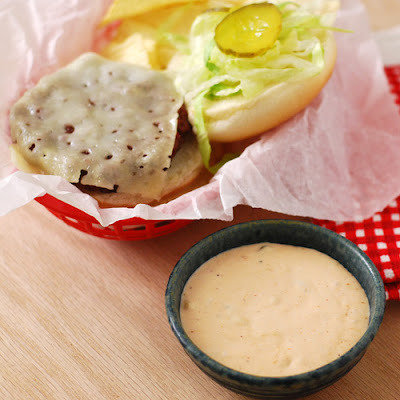 Slather the creamy red pepper sauce on the buns and top with the sliced chicken. March Madness is here and the NCAA basketball tournament has kicked off for this weekend. 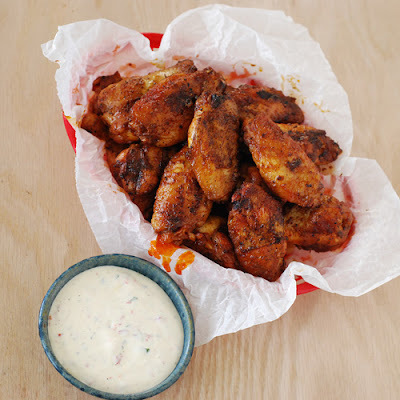 Wings are always a great “game day” food and here is one I made this past weekend. Preheat a grill set up for indirect heat (or an oven) to 350f. Mix the “dunk sauce” together and refrigerate. Dry the wing pieces well* and season with the dry rub. Cook the wings for 30 minutes and then flip the wings. Cook another 20 minutes. Meanwhile, whisk together the “toss sauce” over medium heat. 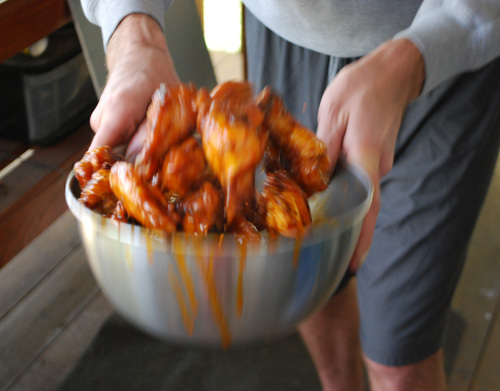 Toss the wings in the toss sauce and grill another 5-10 minutes. This helps get a crisp skin. 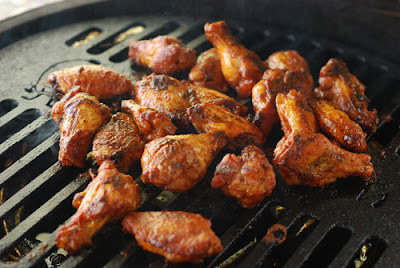 Grilling indirect makes wings nice and roasty toasty! Served with dipping sauce…..oh yeah! I fire roasted a Cuban pork roast earlier this week and while it was cooking, I decided to cook a few twice baked potatoes at the same time. Baked potatoes are good, but twice baked potatoes are even better. Twice as good, to be exact! Wash and dry the potatoes. Give a light coating of oil and season liberally with salt. 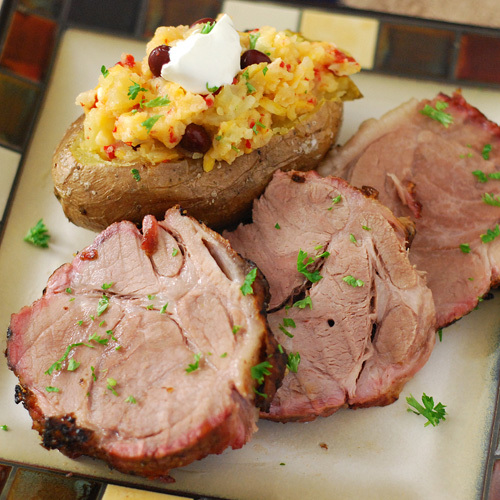 Place the potatoes on the grill and cook for about 60-90 minutes, until the potatoes are slightly soft to the touch. Remove potatoes from the grill and allow to cool for 5 minutes. Holding each potato with an oven mitt, carefully slice off the top 1/2 inch of the potato. Using a small spoon or scoop, hollow out each potato, reserving the potato pulp in a large bowl. Add the butter, sour cream, cheese, red pepper, beans, salt and pepper to the potato pulp and mix well. Spoon this mixture back into the potato shells. Place the potatoes back onto the grill for another 15 minutes. 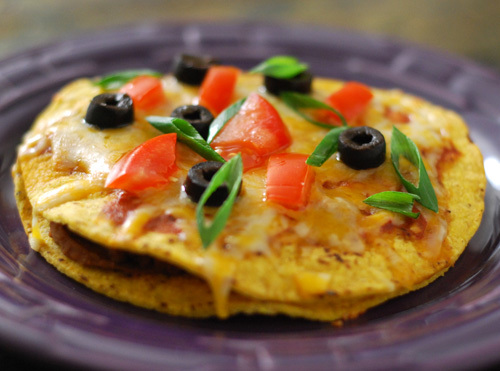 Top with sour cream, additional cheese, or any other toppings that you choose. Yukon gold: I prefer Yukon gold potatoes for their buttery smooth texture and slightly sweet taste. You could use regular bakers instead. Temps: You could also cook these faster at 400f, but I was already cooking something at 350f in the grill so that is what I went with. 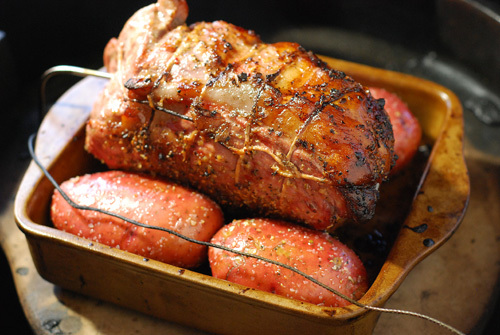 My potatoes doubled as a roasting rack for the pork roast. I don’t eat much fast food but I do have a few “guilty favorites”, most of them from my teenage years. Way back in the 1980’s my buddies and I would hit Taco Bell on Third Street in Jax Beach after surfing all day and the Mexican Pizza was one of my favorites. I had the craving for one last week and bought one at lunch. Nostalgia isn’t what it used to be, because that thing was depressing. Soggy, sauce all poured off the side, and a mess. Plus, they don’t make them with green onion or black olives anymore. I went home that night and made my own version. MUCH better! Craving Satisfied. So I didn’t use a grill, how is this “Fire Day Friday”? It uses a fiery enchilada sauce that uses Rotel’s new (new to me) tomato & chile sauce. 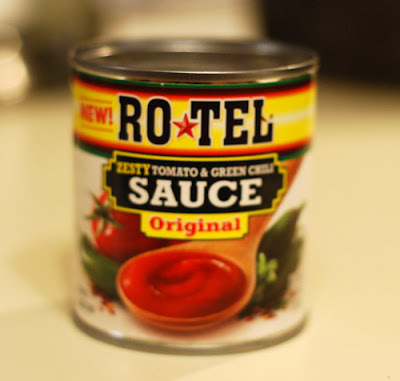 Not Rotel tomatoes, just sauce. I stumbled on it at the store and like it for the base of sauces like this. Anyway, here is how you can make your own Mexican Pizzas. Mix the sauce ingredients in a small sauce pan and simmer over medium heat. Stir occasionally. Cook the taco meat according to directions EXCEPT – after browning and draining the ground beef, quickly saute the onion and garlic before add the beef back to the pan. Resume package directions. Heat the refried beans over medium low heat. Place 4 corn tostadas on a cookie sheet. Top each with 2-3 Tbsp of beans and 2-3 Tbsp of the cooked beef. 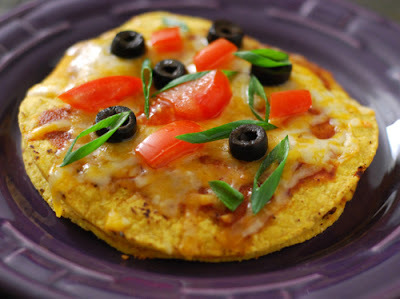 Top each with another tostada, 2-3 Tbsp of the enchilada sauce, and cover with shredded cheese. Place in the oven just long enough to melt the cheese, about 1-2 minutes. Top with tomatoes, green onion, and black olives. Serve immediately. Taco Bell uses flour tortillas but we like the crunch from the corn tortillas. I am trying to kick winter on it’s way by cooking summery dishes like Bahamian Grilled Chicken and the Caribbean classic side dish, peas and rice. Crisp the bacon in a large 3 quart pot over medium high heat. Remove with a slotted spoon to a paper towel covered plate. Remove all but 2 Tbsp of the grease. Saute the onion, bell pepper, garlic, basil, thyme, salt, and pepper for 5 minutes. Stir in the tomato paste and sugar, cook another 2 minutes. Add 5 and a half cups of water and 1 Tbsp of lime juice and bring to a boil. Add the rice, cover, and cook for 15 minutes. Stir in the crowder peas and cook covered another 3-5 minutes. Remove from heat and let stand covered 5 minutes. Then fluff with a fork and serve. *I have NO affiliation with these people. But I LOVE fresh basil in the summer when we grow it in our yard. Dried basil just depresses me. I tried this stuff for the first time this week and it’s the best “winter” basil option I have stumbled across. I don’t like salmon but my family absolutely LOVES it, so I make it for them often. 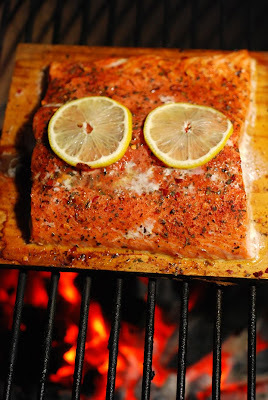 One of their favorite ways is when I cook the salmon on a cedar plank on the grill. The smoldering plank provides additional seasoning to the already zesty potlatch seasoning and it also makes for an interesting presentation. Cedar planks used to only be found in specialty stores like Williams Sonoma or grill stores but these days I have seen them in some grocery stores. Preheat a charcoal grill set up for direct heat at 350f. Mix the spices together for the potlatch seasoning. 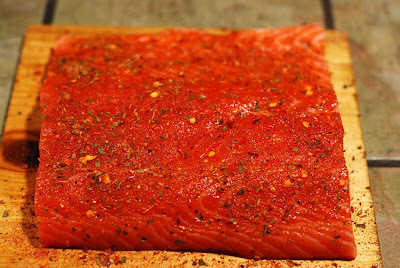 Place the salmon fillet skin side down on planks and season liberally with the potlatch seasoning. Depending on the size of your fillets, you might have a little extra seasoning leftover. Top each fillet with two lemon slices. Place the planks on the grill, close the lid and cook until the internal temperature of the salmon is 120-130f. Remove from the grill and serve immediately. You can serve directly on the planks or remove it from the plank. if the skin wants to stick to the plank, no big deal, just use a spatula to separate the fillet from the skin. Here are several ways to test for doneness when grilling fish. The tips are from the Cooking Fish Fundamentals lesson at Rouxbe Online Cooking School. Test for doneness early and often. A rough guide is 10 minutes total per inch of thickness. 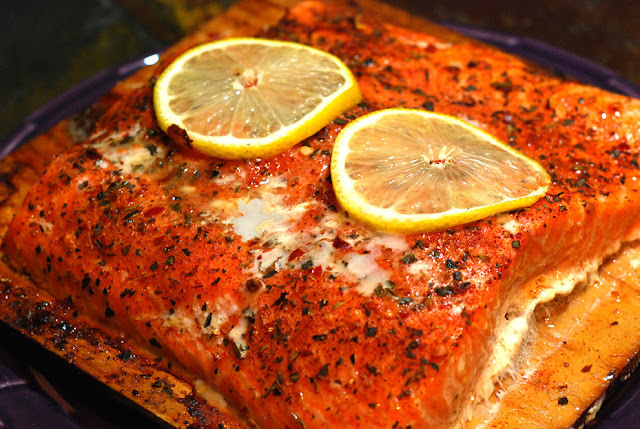 Cook to an internal temp of 120-140f but fish with dense flesh (tuna, salmon) can be done at 120f. The spicy rub, salmon and smoke are a nice combination. Sometimes simple is better. This appetizer is quick, easy and tasty! It also always disappears from the tray at tailgates and parties. Marinate the shrimp in the oil, lemon juice, salt, and garlic for 30 minutes. Remove shrimp from marinade and reserve marinade. Place shrimp two each on cocktail skewers. Season both sides with fresh cracked black pepper. 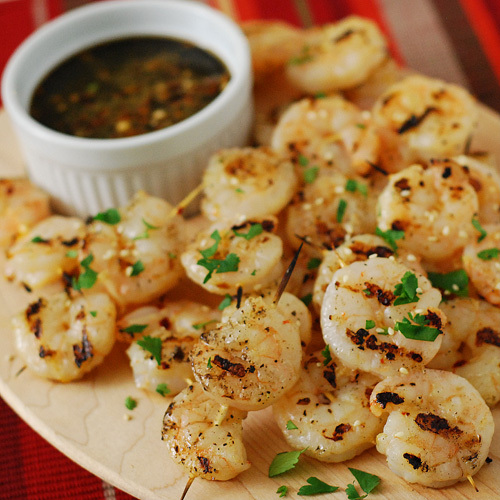 Grill shrimp for 3 minutes. Brush shrimp with the reserved marinade and flip. Brush the other side. 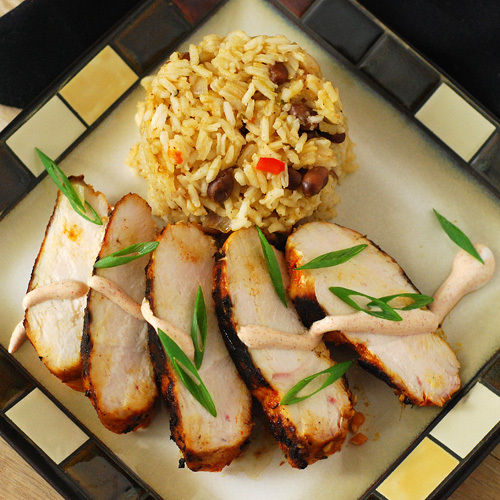 Garnish with cilantro and toasted sesame seeds and serve with your favorite terriyaki sauce. It is time again for Fire Day Friday here at Our Krazy Kitchen. 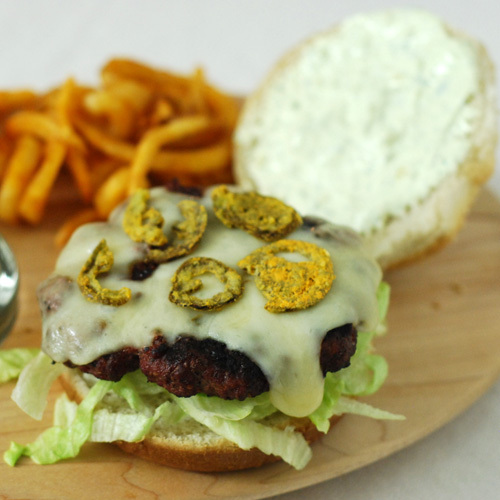 Since my blog is all about grilling, BBQ, and live fire cooking, we cook a lot of burgers. A lot. 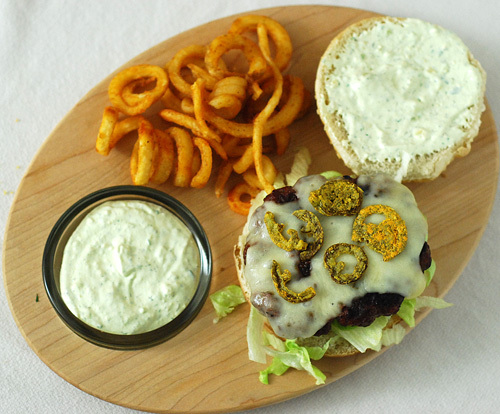 But my kids favorite burger is actually rather simple. You might notice the similarities to a Big Mac but it is grilled, tastier, and it is not a toppling mess about to fall over. 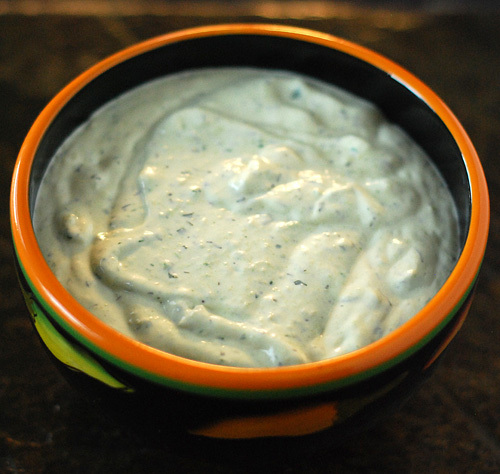 Mix the dressing, garlic and chipotle together and refrigerate an hour before you start making the burgers. Mix the ground chuck and burger seasoning together. Divide into four portions and make into 4″ patties*. Grill the burger patties for 4 minutes. Sprinkle a pinch of salt on the burgers and flip. Season the other side with another pinch of salt and cook another 3 minutes. 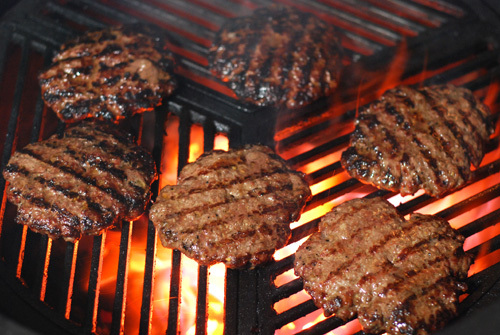 Top each with a slice of cheese and cook another minute or until the burger is an internal temp of 165f. Place patties on bun bottoms. Slather the bun tops with some of the “special sauce” from step one. Top with lettuce and 3 pickles. Season with a pinch of black pepper*. I like using Weber brand burger seasoning. Really, making your own is 100% better than anything you can buy off the shelf. Working with cold meat and cold hands is important to keep the fat from melting while making the patties. If it breaks down, your burger will end up dry and flat. Seasoning with the black pepper is a small touch but it really makes a difference. I swear it freshens the lettuce up or something.